Samsung Internet v6.2 now Stable! Coming soon to an Android 5+ device near you! With Night Mode, Tracking Blockers and all the great features from the Beta. With a big thank you to all of our beta testers, Samsung Internet v6.2 is now being released to our Stable Channel. In the next few days it will become available via the Play Store and Galaxy Apps store on. So, what’s new? Available on all phones running Android 5.0 and above! 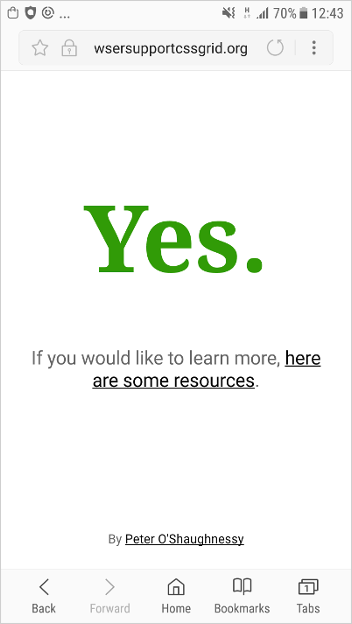 store to get access to the newest features of the secure, private and optimized mobile web browser. 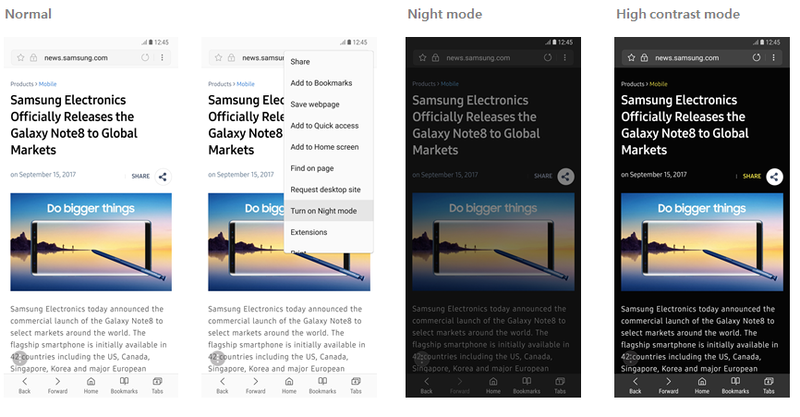 If you regularly find yourself browsing the web in bed then Night Mode may be the feature for you. Night mode reduces the amount of bright light from your phone, perfect for when you want to wind down before sleeping. Under the menu, select Turn on Night mode to try it out. Make reading the web more accessible and comfortable with our new High Contrast mode. Found under Settings > Accessibility, this feature will show text in white on a dark background meaning less light in your eyes with more easily readable text, especially helpful for our visually impared users. Download, install and manage your adblocking services directly from the updated Content Blockers section of the Settings menu. Save your privacy, your battery life and your data plan! Keep your browsing habits and information out of everyone else’s hands with the new Tracking Blocker. Many websites include trackers that log your activity across multiple sites and some are even malicious. 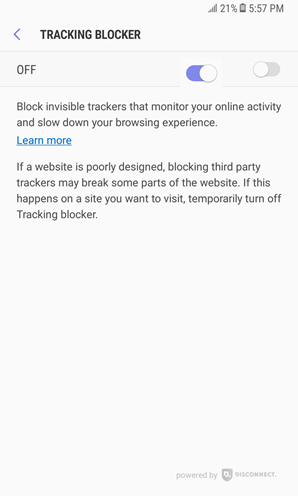 The built in Tracking Blocker extension, powered by Disconnect Inc, will block all trackers making your browsing private. This feature is enabled by default when you are in Secret Mode. You can read more about it here. If you use Chrome on a desktop, you’ll now be able to sync your bookmarks with the new desktop Chrome extension, allowing you to access your Samsung Internet bookmarks on your desktop and your Chrome bookmarks on your phone! You’ll also be able to enable ‘Sync with Samsung Cloud’ in the settings menu to allow syncing of your bookmarks, saved pages and open tabs across all of your Android devices. CSS Grid Support is here! The CSS layout system we’ve all been waiting for: Grid gives developers the ability to create 2 dimensional layouts allowing control over columns and rows of elements. A much more powerful layout tool than previously offered by CSS. If you’d like to learn more about CSS Grid, here is a list of resources and a fun game. Starting in the US, Samsung Pay will be available to use with Web Payments to allow a frictionless, secure checkout experience using your digital wallet and biometric authentication. Use the payment processor of your choice and protect your credit card from interception or replay attacks. 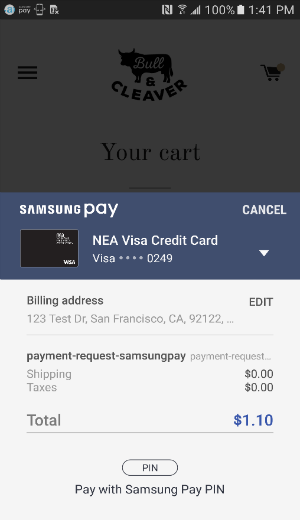 If you are interested to accept Samsung Pay on your website, you can read how to get started here. Now you can also earn Samsung Rewards points, simply by using Samsung Internet! Starting in the US on Samsung Pay eligible devices, you’ll be able to earn rewards in a variety of ways, then spend your points on everything from gift cards to the latest Samsung products. See here for further details. We already support WebVR in Samsung Internet for Gear VR. The WebVR flag will enable support for other headsets such as Google Cardboard, eliminating the need for a polyfill. Now you can access and control Bluetooth devices from your web browser! WebGL2 brings OpenGL ES 3.0 level rendering capabilities to the Web. Gamepad Extensions provide additional Gamepad API capabilities for controller orientation and touch position. We hope you enjoy version 6.2 and as always, we look forward to hearing your feedback! Thanks to Peter O'Shaughnessy, Daniel Appelquist, and Jungkee Song.